“Nobody saw me as this weird, white-girl alien coming from another universe,” said Simone Hyman ’15 about her experience in India this summer. Hyman, who researched the stigmas surrounding mental illness in India with the MINDS [Mental Illness and Neurological Disorders] foundation, is one of several Wesleyan students who traveled abroad this summer to work for non-profit organizations. The MINDS foundation sent students to rural India in order to conduct research and volunteer at local hospitals, while SHOFCO organized a trip to Kibera, Kenya, where The Kibera School for Girls and clinic are based. The young activists interviewed by The Argus had only positive things to say about their abroad experiences and emphasized the transformative nature of international service work. Although Hyman wasn’t, as she says, seen as an alien or an outsider by the patients she worked with, she noticed significant differences between rural Indian culture and her life at home. Throughout the process of interviewing patients, Hyman found that mental health treatment in India is not at all like it is in the United States. Hyman conducted dozens of interviews with patients on their experiences with mental illness, and how it is perceived in their communities. She was often touched by their honesty and amazed by their stories. Back at the University, Hyman intends to continue MINDS’s work of promoting universal mental healthcare. Setareh O’Brien ’14, who joined MINDS last winter, explained the process of preparing for the trip and the importance of respect and flexibility when volunteering in a different country. Compared to service work at home, volunteering abroad can have different challenges and rewards. Although she fundraised for MINDS at Wesleyan, the experience of traveling to India was especially eye-opening for O’Brien. The trip allowed O’Brien to connect with and better understand the people she’d been sponsoring. 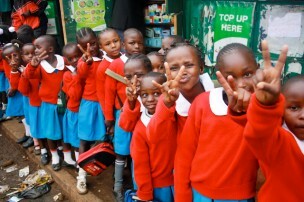 Maeve Russell ’14 traveled to Kibera, Kenya this summer to participate in SHOFCO’s summer institute. The institute continues the work that SHOFCO does over the school year. A third-year member and SHOFCO’s liaison to the Office of Community Service, Russell was inspired and humbled by what she observed in the Kenyan slums over the summer. As someone who has participated in both local and international service work, Russell doesn’t see one as more important than the other. Russell finds SHOFCO to be particularly inspirational for its members because of the direct contact they have with the students in Kenya and the opportunity for personal connection.